A better market mood made safe-haven currencies gave back some of Friday's gains. German Business Climate improved in March despite discouraging macroeconomic figures. The EUR/USD pair peaked at 1.1331, settling around 1.3110 by the end of the day. The advance was a mixture of a positive German report and easing dollar demand as the dismal performance of equities that started Friday came to a halt during London trading hours, with Wall Street posting a modest intraday slide, off its daily lows. As for data, the German IFO survey showed that the Business Climate Index rose to 99.6 in March from an upwardly revised 98.7 in the previous month. The Current Assessment improved to 103.8 while Expectations surged to 95.6, all of them beating the market's consensus. The US released the Chicago Fed National Activity Index which came in at-0.29 in February, while January's figure was upwardly revised to -0.25 from -0.47, and the Dallas Fed Manufacturing Business Index for March, which printed 8.3, better than the 7.0 expected. The pair retreated ahead of the close amid the absence of a bullish catalyst and a heavy Pound. Tuesday will bring the German GFK Consumer Confidence Survey, seen at 10.8 in April, unchanged from the previous month, while the US will release Housing Starts and Building Permits for February, and the latest CB Consumer Confidence Index. 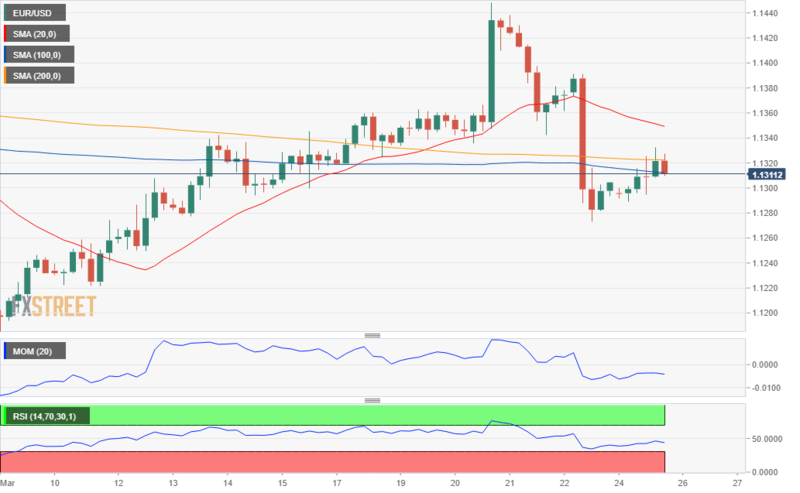 The EUR/USD pair is struggling now around the 50% retracement of the 1.1175/1.1447 rally, with this Monday's recovery looking corrective after Friday's slump, as technical indicators in the 4 hours chart have recovered from oversold readings, with the Momentum heading higher well below its mid-line and the RSI having already lost upward strength, now consolidating around 45. Furthermore, the pair was unable to clear the 100 and 200 SMA, which anyway lack directional strength, and continues developing below a bearish 20 SMA, which now nears the 38.2% retracement of the mentioned rally, reinforcing the strength of the static resistance level at 1.1445.